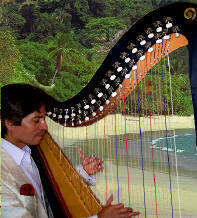 Ricardo García-Curbelo studied the harp at the Music Academy of Villavicencio, with Luis Alberto Curvelo, his brother and Director of the institution. Ricardo later became Director of Dance for 3 years at this academy. He studied music theory at the Music Academy Luis A. Calbo and attended voice production classes with legendary maestro cultural promoter, Manuel Zapata Olivella, at the National University in Bogotá. 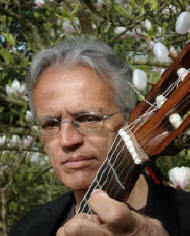 Ricardo specializes in Joropo, a music that combines poetry, with Classical, Flamenco and Jazz music. He plays the Modelo Corvado 42 string harp. Ricardo is a unique and dedicated artist, known and loved for his passionate, gifted way of communicating with the public. The special talent that he showed early as an artist on stage to the maestro representatives of Llanero music (Joropo), led him to be the youngest dancer and composer poet and performer from his region, to be awarded International first prizes on several occasions. He is a winner of six international competitions in his homeland, three as poetry writer and performer and three as a dancer. As a poet Ricardo is artistically known as El Cóndor. In the UK he has given a wide range of performances; his artistic field embraces the stage from radio, television, satellite and film documentaries to educational institutions, private functions, charity performances and concerts. He is delighted to share this concert with Kai Jansen at Theatro Technis. Kai Jansen has been a working musician for 39 years as a guitarist, vocalist and songwriter. This has include a range of performances from pubs, restaurants, hotels, to National and Provincial BBC TV and radio, to concert stages in Britain, Germany and Japan, playing classical guitar recitals or sub-billings to performers like Mike D’Abo (ex-Manfred Mann), Nina (of Nina and Frederick’) and Bridget St.John (New York’s famous café singer/songwriter) in the heyday of the folk-rock movement. He has produced 4 albums on his own label – Peartree Recordings, 3 vocal and one instrumental. These range in style from popular song arrangements to more worked-out guitar compositions with string, synthesisers and various acoustic instruments, to the 3rd, an all-original song collection called ‘Worlds Apart’. His latest vocal album is a live production called ‘Lifeforms’, which contains 12 covers and 5 original tracks. July 2002 with an appearances at Theatro Technis, followed by many others, around the U.K., including a performance in the Old Trafford Stadium, home of Manchester United, as support act to Samantha Mumba for the ‘Super Rugby-League Grand Final’, to a crowd of 64,000 people. Since then, family ties have kept him closer to home in Hampshire.